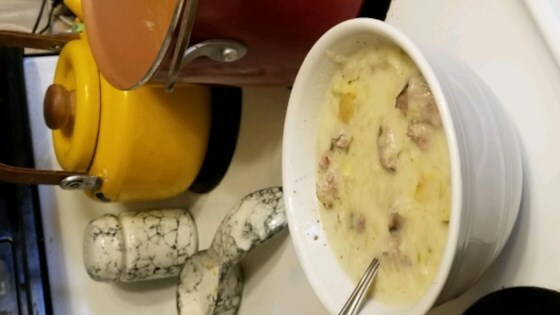 "Italian sausage or regular pork sausage also work well with this soup. Serve hot with chunks of good crusty bread, if desired." In a large skillet over medium high heat, saute the sausage for 10 minutes, or until browned and crumbled. Drain well and discard the fat. When the mixture in the pot thickens, add the cheese and stir off and on until the cheese has melted. I added a good dark German beer when I added the cabbage, it gave it a wonderful extra flavor. When I was cooking this it looked odd and I was worried! I added some spices to the recipe. It was delicious! Thanks for sharing this recipe. Substituted broccoli for cabbage, and 1/2 cheddar 1/2 mozzarella for swiss cheese.